Arbors Direct See Ad on page 215 Information Request # 9280 Arbors Direct, the leader in fiberglass pergolas and arbors, has large beam, column options, and 22' clear span, increasing design options for shade structures. Our in-house design team is ready to work with you. 800-930-7495 arborsdirect.com ShadeTree Cool Living, LLC See Ad on page 89 Information Request # 9239 A ShadeTree pergola structure can be free- standing or attached to a building, and made to fit any style or budget. This custom designed pergola has a ShadeTree Forester Overhead Canopy Kit adapted to fit under the decorative pergola beams. 800-894-3801 shadetreecanopies.com 204 Landscape Architect and Specifier News 2016 Specifier's Guide outdoor living Pergolas (Continued from page 202) Perfection Fence See Ad on page 180 Information Request # 9171 Designs of Distinction ~ Creative Possibilities. Outstanding details, traditional and modern materials including wood and vinyl. Custom craftsmanship, hand built quality; one project at a time. 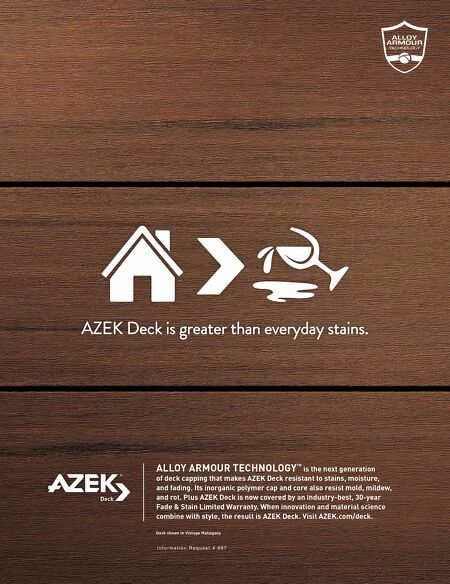 Quality without Compromise. 800-537-2900 perfectionfence.com Structural Pergola Systems See Ad on page 214 Information Request # 9343 The strength of our structurally reinforced fiberglass supports polycarbonate, ceiling fans, light fixtures, TVs and more to keep you comfortable in your outdoor living space. 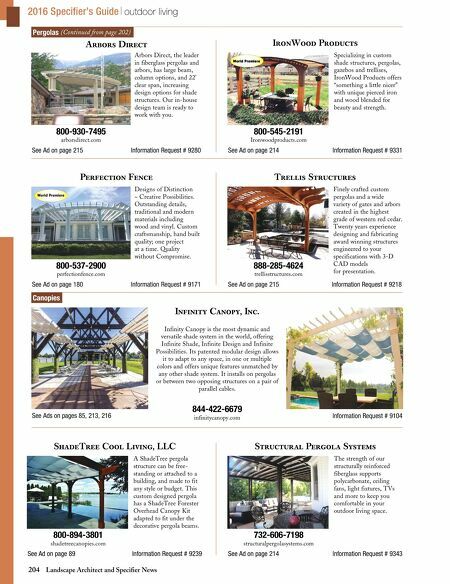 732-606-7198 structuralpergolasystems.com Trellis Structures See Ad on page 215 Information Request # 9218 Finely crafted custom pergolas and a wide variety of gates and arbors created in the highest grade of western red cedar. Twenty years experience designing and fabricating award winning structures engineered to your specifications with 3-D CAD models for presentation. 888-285-4624 trellisstructures.com IronWood Products See Ad on page 214 Information Request # 9331 Specializing in custom shade structures, pergolas, gazebos and trellises, IronWood Products offers "something a little nicer" with unique pierced iron and wood blended for beauty and strength. 800-545-2191 Ironwoodproducts.com World Premiere Canopies See Ads on pages 85, 213, 216 Information Request # 9104 Infinity Canopy, Inc. 844-422-6679 infinitycanopy.com Infinity Canopy is the most dynamic and versatile shade system in the world, offering Infinite Shade, Infinite Design and Infinite Possibilities. Its patented modular design allows it to adapt to any space, in one or multiple colors and offers unique features unmatched by any other shade system. It installs on pergolas or between two opposing structures on a pair of parallel cables.